Robust, Reliable and Neutral. Useful for a wide range of applications, including wine and fruit cider fermentations. Lalvin EC-1118 is the original ‘prise de mousse’. It was isolated in Champagne and its use is validated by the Comité Interprofessionnel du Vin de Champagne (CIVC). 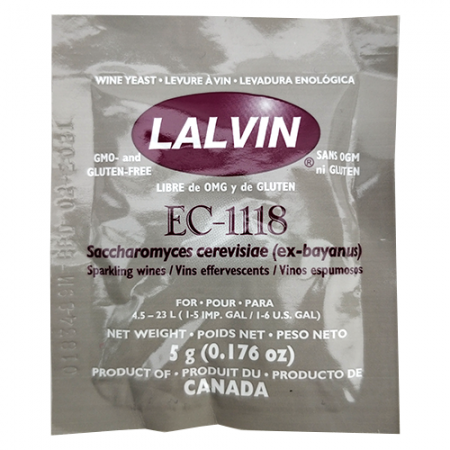 Its strong competitive character, its ability to ferment at low temperature, good flocculation and excellent alcohol tolerance, make Lalvin EC-1118 an excellent strain to be used in a wide range of applications (such as sparkling wines, fruit wines and ciders). Note: dosage range is based on the must sugar content and sanitary state of the grapes and winery. Rehydrate Lalvin EC-1118 in 5 times its weight of potable water at 40°C. Let stand for at least 20 minutes then gently stir occasionally to break up any clumps. Add to the must. – It is essential to rehydrate the yeast in a clean container. – Initial rehydration in must is not advisable.